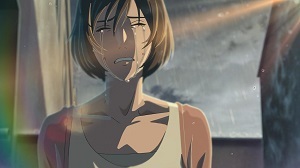 Makoto Shinkai is kind of a Big Deal in the anime world. It just so happens that I recently watched Voices of a Distant Star (Hoshi no koe), a film often mentioned in top ten anime lists, and was horrendously underwhelmed. Way too short, the film felt like more of a proof of concept rather than a complete story. Thankfully, this isn’t the case with The Garden of Words. Ostensibly a feature film, though only running 46 minutes, it tells the story of Takao (Miyu Irino), a student who has trouble focussing on his schoolwork and instead fills his days dreaming of being a shoemaker. (And let’s face it: we’ve all been there, haven’t we? Amirite, fellow dream cobblers?) He skips school, going down to the local traditional Japanese garden to work on his sketches. Whilst there, he comes across Yukino (Kana Hanazawa), a woman who spends her time in the park’s pagoda doing nothing more than drinking beer and eating chocolate. Without so much as a word shared between them, the two begin spending time in each other’s company regularly, and a touching relationship develops. The first thing you’ll notice about The Garden of Words is that the animation is stunning. And I mean absolutely, jaw-droppingly beautiful. I was amazed by the opening frames showing the park’s fauna rustling in the breeze – I couldn’t tell if I was looking at filmed footage that had been rotoscoped, or if it was created entirely in a computer. This really is one of the most beautiful animes I’ve ever seen. The character animation is nothing spectacular, but the attention to detail in the static backgrounds is incredible. Whether it be the small connector symbol on a mobile phone charge cord, or a close-up on cracked foundation in a make-up compact, this is a film that concentrates on the small things. This means that the world feels much more tangible, and the characters more relatable. If you’re a devout fan of Shinkai’s work, then this Blu-ray is for you. Since the film is quite short, some of the special features themselves run longer than the feature itself. There are interviews with the actors and director as well as various trailers and a short retrospective on Shinkai’s other films. The best feature, however, is the complete storyboards for the film, which run for around 50 minutes. Unfortunately, the audio for this is in Japanese with no subtitles, but it’s still a fascinating look at the pre-visualisation stage of the film. There’s a lot that, ironically, goes unsaid in The Garden of Words, such that when the climactic scene arrives, it’s a bit of a surprise. Shinkai did this in Voices of a Distant Star also, and whilst it may set him apart from his contemporaries, it’s still problematic. Since Japanese animation often involves characters staying very still, their faces expressionless, you don’t get the same kind of unspoken performance you can from a real, live actor. Thus, when the outpouring of emotion suddenly arrives, it seems a little over the top. It’s a small problem but perhaps hints at a broader issue within the medium. If more attention was placed on the character animation, with the flicker of an eyelid or hint of a smile, this would allow for better character performances, instead of having to rely on dialogue. 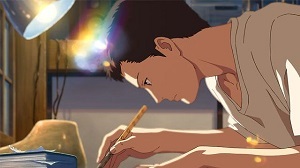 Nevertheless, The Garden of Words is a solid animation. It’s a simple tale that isn’t afraid to focus on feelings and ambitions that aren’t grandiose or world shattering. Instead, it’s all about unfulfilled dreams and the emotions that we deny ourselves. Fans of Shinkai’s work will lap this up, whilst those who love their anime minus all the stereotyped conventions and narrative tropes should check this out. The Garden of Words is available now on Blu-ray and DVD from Madman. This entry was posted in Film Reviews and tagged Anime, Drama, Romance by Stuart Wilson. Bookmark the permalink.